Hand Strap is a type of plastic strapping. Hand strap is generally used for light to medium load bundling and palletizing. 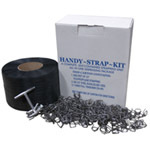 Hand strap plastic strapping can be used in manual tensioners as well as battery operated strapping tools. The correct type of plastic band depends on the load that the strapping will handle. In general, wider straps have a higher resistance to breakage and are capable of handling heavier loads. The core size of you plastic strap should match the dimensions of your dispenser. 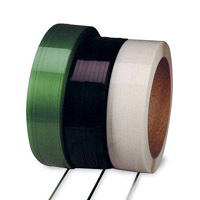 Hand strapping requires that the product be secured using a seal or buckle for plastic band. 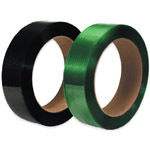 Boatman Marking has a wide array of plastic strapping along with strapping tools and strapping equipment. Remember that plastic strapping uses recycled plastic and can be recycled. Please give us a call if you have questions about using plastic strap.